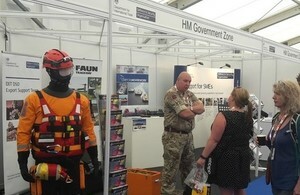 DIT Defence and Security Organisation (DIT DSO) supports UK defence and security companies at this year's Seawork. The Military Export Support Team were kept busy throughout the show by UK SMEs wishing to increase their overseas defence/security sales potential. The annual Seawork exhibition and conference took place at the Mayflower Park, Southampton between Tuesday 13 and Thursday 15 June 2017. Once again DIT DSO led on UK government help at the exhibition. They were able to offer UK companies a wide range of advice, information and support aimed at increasing overseas defence and security sales. DIT DSO’s principal customers were UK SMEs, who received informal advice or attended pre-booked appointments to meet DIT DSO experts to discuss more specific export opportunities. The stand was manned throughout by the DSO Small Business Unit and the Military Export Support Team. They were joined at the show over the 3 days by a number of DIT DSO colleagues from the regional directorates and high growth team. Access to the stand was also extended to Department for International Trade (DIT) colleagues from the regional international trade and MoD business advisory teams. Seawork International is the largest and fastest growing commercial marine and workboat event to be held in a working port. This annual conference and exhibition is in its 20th year and is an important fixture on the DIT DSO exhibition programme. The show itself largely focuses upon civil and commercial maritime sales. This provided DIT DSO with an excellent opportunity to engage with new potential customers and to showcase the possibilities and benefits of diversifying into the overseas military market. Examples of the range of kit that military colleagues have helped to sell in the past provided an attractive draw to the stand. This helped potential exporters understand just how wide and diverse the overseas defence and security markets can be. DIT DSO hope to have started a good number of UK companies on a new journey into international trade. If you are interested in attending future events contact ditdso.smeenquiry@trade.gov.uk.